Amble is counting down the days until the Tour de Britain passes through the top end of town on September 9. The cyclists will include Olympic champion Bradley Wiggins, and ‘Manx Missile’ Mark Cavendish. They will pass Amble during Stage Four of the prestigious Aviva Tour of Britain cycle race. The route past Amble will be the same route as that taken by the Olympic torch: from Warkworth, up the Wynd, along Albert Street and towards Radcliffe. (See map below). Road closures will affect the town between 13.25 and 14.55. Bradley Wiggins is reigning Olympic, world and British time-trial champion as well as hour record-holder. 36-year-old “Wiggo” will be cycling the race for the eighth time. He won the Tour of Britain in 2013, and was the first British winner of the Tour de France in 2012. The Stage 4 leg of the race starts in Scotland, then enters Northumberland heading along a route from Ford. It then heads to Wooler and Alnwick, before continuing down the coast, through Amble, finishing in Blyth. 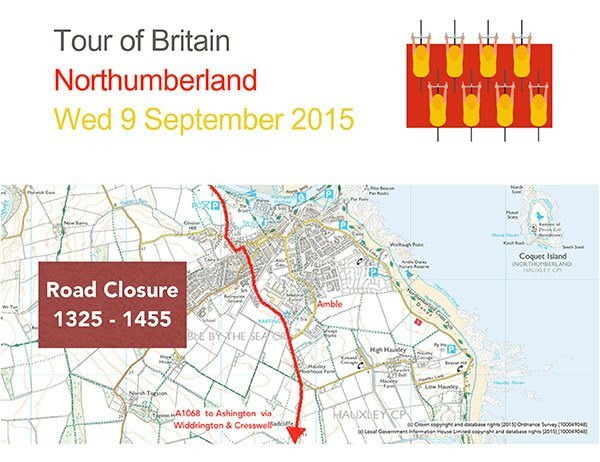 The tour re-starts the following morning from Prudhoe with Stage Five, from Haydon Bridge to Hadrian’s Wall. The race will then head across the Pennines into Cumbria before ending in a summit finish on Hartside Fell. The whole eight-stage race runs from 6-13 September. Last year the UK’s favourites Sir Bradley Wiggins and Mark Cavendish were both in the 120-rider starting line-up. The tour will feature the biggest line-up of UCI WorldTeams to race in the UK this year. Headlining the 20-team list are Team Cannondale Garmin, who won the 2014 Tour of Britain with Dylan Van Baarle and the Etixx Quick-Step team of Mark Cavendish and World Champion Michal Kwiatkowski. Top level British interests are represented by Team Sky. 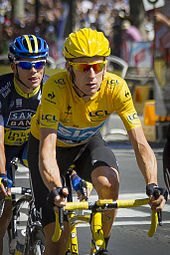 Some teams have been in action in the Tour de France. The race will go through 29 communities in Northumberland, covering approximately 112miles (181kms) over two days of racing.